At the risk of sounding like Mrs. Grinch I have a confession. I don’t like the Holidays. There, I said it. Perhaps if we could go back to celebrating Halloween AND Thanksgiving prior to the barrage of decorations, cards, food, dinner party invitations, commitments, more food, and endless marketing campaigns I might be more amenable to this time of year. I am not. But, not for the reason those of you who know me might think. I have two special needs children with sensory processing disorder (SPD); all of these images of holidays that bring feelings of joy and love to most others, used to bring feelings of anxiety and confusion for my family. Thankfully with the help of many years of occupational therapy both of my sons are now able to participate in many of the year-end celebrations with less stress on them and therefore us. Holidays are about traditions. Here is the thing I have learned about traditions; they are wonderful IF they are working. I remember as a newly married Jewish woman to a (former) Catholic, speaking with my husband quite a bit about our shared vision of family traditions. Little did we know that in two years we would welcome our first son and learn that he had different needs, which necessitated new traditions. Before I heard the word Sensory Processing Disorder (a condition that exists when sensory signals don’t get organized into appropriate responses) I knew something about the world was not working for my son. Events and celebrations that were supposed to be joyful for him and us, were stressful at best, disastrous more often than not. In an effort to make the holiday more enjoyable for our son and us, we decided to host Thanksgiving. 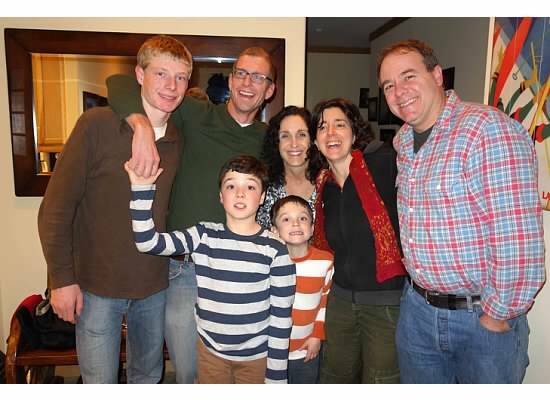 We invited our extended family to join us in our home to take away that stressor for our son. It proved to be one of the best holiday gifts we have given ourselves, and our family enjoys the holiday as well (full disclosure: my husband cooks a mean turkey). I share this story with you, fellow parents of children who have sensory processing disorder, autism, anxiety, ADHD or another known or unknown issue that makes taking your family on the road difficult. Not to worry you have options, I have listed a few below. Preparation is not just for turkeys. Explain to your child and family what you desire to happen. “We will go to Grandma and Grandpa’s house at 2:00PM and will stay until 7:00PM, your cousins will be there and Uncle Bob will be watching football. If you need a break you may join your Uncle with your iPad. Remember, sometimes things don’t go as planned, I really appreciate it if you can try to be as flexible as possible. Let Dad or me know if you need a break.” My husband and I have found explaining to our boys what to expect ahead of time minimizes their anxiety. The best laid plans: I learned to have a back up plan to my back up plan. When my children were little this would consist of a change of clothing (maybe three), favorite toys, extra food (especially if we were going out to eat), music, headphones, etc. I would also prepare them with the warning that things don’t always go as planned. My oldest son is literal and has said, “You said we would eat at 6 PM, but, it is 6:07 where is my dinner?” I taught my son what “ish” means. When we say that we will eat at 6-ish he should take it to mean 5:45 – 6:15. Accommodating accommodations: Special Needs Parents are excellent advocates for our children during IEP and 504 meetings. Why is it that we lose these skills with our family and friends? Once my husband and I were ready and able to ask those closest to us for help (and spell out what we needed) holidays became less stressful. For us it meant hosting Thanksgiving so our Autistic son would have the ability to check in and out as necessary to accommodate his sensory issues. Sensory: All those wonderful smells that bring you back to your childhood has the potential to make your child feel apprehensive. Most people do not understand this; I didn’t until I had a son with SPD. Tactfully explain that the smell of the Christmas tree and scented candles are overwhelming for your child. Ask your host if it would it be acceptable to move the candles during your visit. Have a quiet plan. Explain to your host how all the excitement during this time of year sometimes overwhelms your child. Then ask if your son or daughter may take refuge in another room from time to time. Reminders: Advanced notice can prevent tears and tantrums. “We are going to be leaving in a half hour.” Then give 10-minute reminders, which should make an easier transition for our children. Just say “No” It is okay: If you are overwhelmed, your child is anxious or it feels like it is all too much, it may be time to leave. Take a deep breath, grab your most cozy cow slippers, a bottle of wine, your partner and exhale. You should give yourself permission to enjoy the holidays in your own unique way, and at your speed. Deflect the pressure from what others think: rather, make the time meaningful for you, your child and your family unit. December Holidays true meaning is NOT gifts: Really, look it up. It is hard for many people to believe but gift receiving is stressful for children on the autism spectrum and many with SPD. A nice ‘gift’ for those inclined to do so would be 1:1 time with the child doing something they really enjoy. My son loves movies; he loves to go with his Aunts and Uncles or Grandparents. Knowing that he has a movie date is all he needs to feel happy. Not everything went as you hoped or planned? Don’t worry; I have it on good authority the holidays will come again next year! What did I leave out? Tell me your tips for surviving the holidays with your special family; I would love to hear from you.